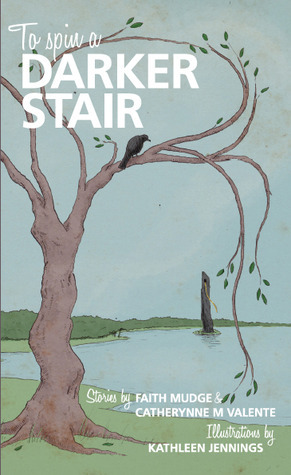 To Spin A Darker Stair is a short chapbook that pairs two fairytale reworkings: A Delicate Architecture by Catherynne M Valente and The Oracle’s Tower by Faith Mudge. Valente’s story is a reprint, picked specifically to complement the story by Mudge. Thematically, the stories are well-matched. Both carry a strong fairytale atmosphere and give the reader a sense that anything is possible. Both have a similar angle on their protagonist. However, this similarity is a double-edged sword. A Delicate Architecture is a wonderfully deft tale, full of rich detail. Pairing it with The Oracle’s Tower serves to highlight the flaws in the latter–flaws that may have been overlooked if paired with a more contrasting story. For example, A Delicate Architecture simply launches into the tale, drawing the reader along with a strikingly unique situation. The Oracle’s Tower, in contrast, follows a worn path wherein the narrator urges the reader to listen to her tale in a somewhat clumsy attempt to impart a sense of wisdom and urgency. This approach always tends to backfire a little for me; I rarely like being told what to do. The ending was framed likewise, setting out a possible conclusion to the story without being at all satisfying. It came across as a writer’s frantic attempt to wrap up the tale before the word count blew out. The illustrations and cover art by Kathleen Jennings deserve a special mention. They tie the stories together beautifully and help strengthen the fairytale atmosphere. Having said that, I thoroughly enjoyed the book. Being only 51 pages, it is the perfect travel book and I devoured the whole lot in a single bus trip. With Fablecroft Publishing scheduled to launch the anthology Phantazein at Conflux 10, it seems certain we can expect more along the same theme from them–especially with Mudge and Jennings making reappearances. However, I also hope that FableCroft will produce more of these chapbooks in the future to help enliven future commutes.